But there is nothing in the Stoic doctrine that says you can't celebrate when that over-popular jackass got what was coming to him, so Zeno of Citium partied hard that night. 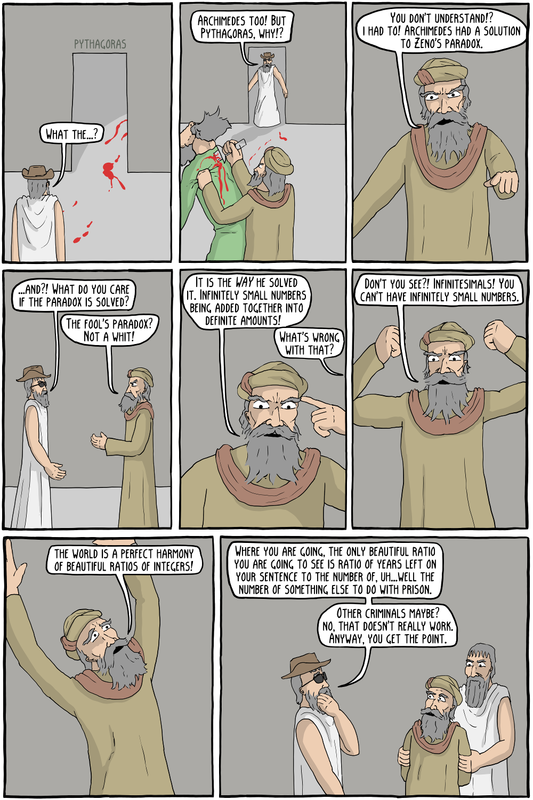 This comic, insofar as it makes sense at all, is about Zeno's Paradoxes. Aristotle himself was the first to propose that the solution to Zeno's most famous paradox. The paradox has us image an arrow going towards its target. Zeno says the arrow must first travel halfway to the target. But then, once it gets halfway, it has to travel halfway again from that point, and so on. There are an infinite number of "halfways", and since you cannot travel an infinite number of distances in a finite amount of time, motion is impossible. Aristotle says that each successive distance reduces in the same proportion as the time it takes to travel it, so the arrow can still go infinitely many "halves" because they get infinitely small. A decent solution, but he didn't offer much support for it. Archimedes, however, conclusively proved for the first time that an infinite series can add up to a finite amount. He gave a geometric proof that a series similar to the paradox, 1/4 + 1/16 + 1/64..., would add up to 1/3. He did this by showing that each box in the series is in an exact ratio to two identically sized boxes, making the entire series 1/3 the volume of the whole box. This sort of solution described Zeno's Paradox even better with the invention of Calculus, although there are still many that say that mathematical proofs of that nature cannot really solve Zeno's Paradox, as they say nothing about extension in the physical world (i.e., matter and time cannot necessarily be divided infinitely, among other things). There is one theory that Pythagoras was actually not the creator of the famous "Pythagorean theorem". It was created by one of his students (well, more like cult members, as the story goes). He had created a challenge to find the exact ratio of the third side of a right triangle. Instead, the student discovered the Pythagorean theorem, and proved that the square root of two was an irrational number (i.e., it could not be expressed by any ratio of integers). This so enraged Pythagoras, who held that all things were made up of ratios (numbers being the basis of his ontology as well), that he murdered the student and swore the rest of the Pythagoreans to secrecy. However, one of them wrote it down, and it was passed down to us. Looking more into this, it is more in the area of "fan theory" than "historical theory", but eh, whatever. Archimedes's proof is, I guess, in some ways similar to this (don't think about it too much). 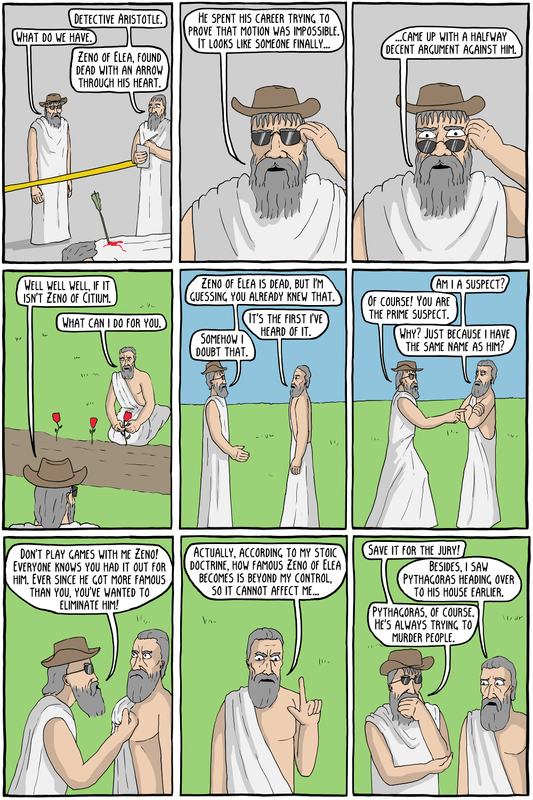 The Stanford Encyclopedia of Philosophy has a great article on the historicity of Pythagoras. Spoiler: we can claim to know very little of his life and views. Zeno of Citium and Zeno of Elea have the same name.